Well what do you know? 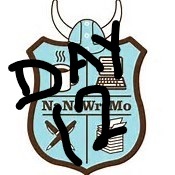 Day Twelve of NaNoWriMo is almost over for plenty of us. My fingers are beginning to cramp and I’d hate to think what they’d feel like if I were using just a pen and paper! I wrote just over 1,000 words today. Not quite my goal so I’m only up to 19,782 words. I’m shy the goal of 20,000 words today. Hopefully everyone else is doing a little better and has reached that goal or just about. I suppose mine isn’t terrible since I’m only shy 320 words. It’s funny, today I was staring down those 320 words like they were an outlaw in some western movie. I thought, “I can write those words easy”, but it was getting late and I’d just finished one of those sentences that seemed to say, “next scene please,” and my mind wandered ten different directions. Man, I hate when that happens. I know, however, that tomorrow I will reach that 20,000 word and more goal, and for me that is quite remarkable. I never thought I’d make it this far in NaNo. It encourages me that I’ve come this far with my writing. And I hope, especially if this is your first NaNo, that if you’ve also come this far, you are encouraged as well. Keep those pens and keyboards going.